I’ve been in a funk lately… I think part of it is the prego hormones. But I think it’s mostly that it’s the Christmas season and well, it just doesn’t feel like Christmas. Christmas is my favorite holiday. 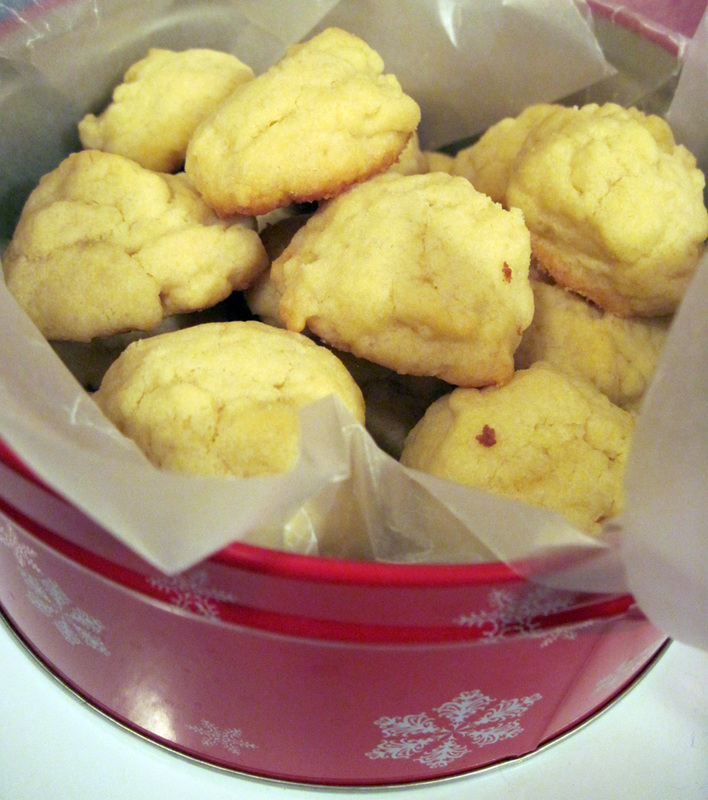 I’ve always loved making cookies with my mom and sister; playing the “I’m thinking of a ornament that looks like…” game at night in the darkened living room with the glittering Christmas tree while sipping on Ovaltine; eating a delicious Christmas dinner; sampling “The Recipe” (a festive holiday punch… it’s got enough alcohol in it that there is a fair bit of family lore about various relatives awakening in bathtubs and under tables on Christmas mornings past). But this year it’s just Shawn and me, alone for Christmas. To be fair, it’ll be our only Christmas just the two of us, but it just doesn’t feel the same. It feels a little lonely. We don’t have a Christmas tree because we’re trying to save money and because our kitties have never been around a Christmas tree, so they’d probably take to scaling it in the wee hours of the night. I can just hear the shattering of ornaments now. We live in an apartment, so there’s no lights to string, no halls to deck, as it were. A downright bummer, if I let it be. So you know what? It’s time to get Festive. With a capital F. We’re gonna make this Christmas happen. I even made a list. We’re going to go look at Christmas lights this week around town. We’re going to make a delicious Christmas dinner: Lamb with mint jelly, twice-baked potatoes, homemade apple sauce. We’ve got some Christmas movies to watch. I’ve got a date with a nice glass of eggnog. I’m going to make stollen for the first time ever. I’m digging out the construction paper to make a paper chain to hang. We’ve been enjoying the Season of Advent church services we’ve attended and we’re looking forward to the Christmas Eve service Saturday. 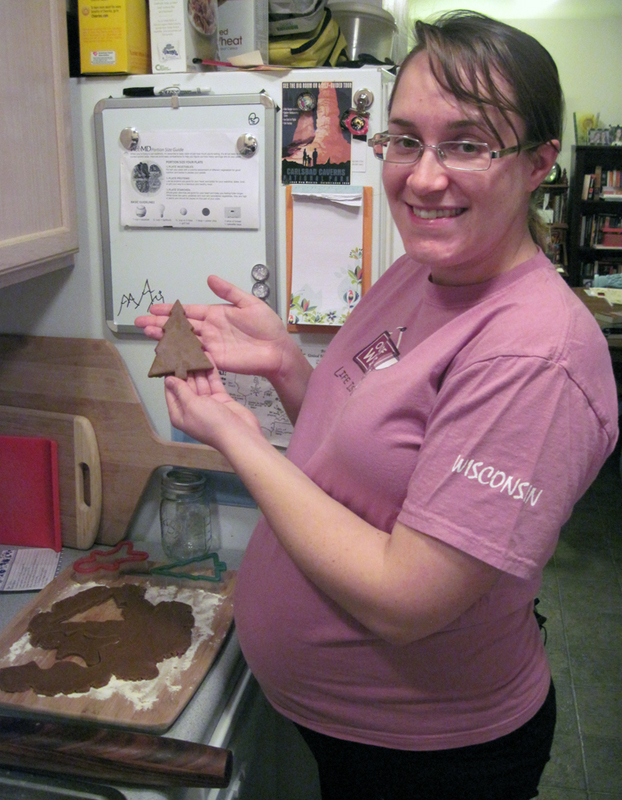 And today we made Christmas cookies. Note Shawn's shirt. And yes, it glows in the dark. Today’s festive creations are not low calorie. In fact, we used four sticks of butter. That’s right. FOUR. 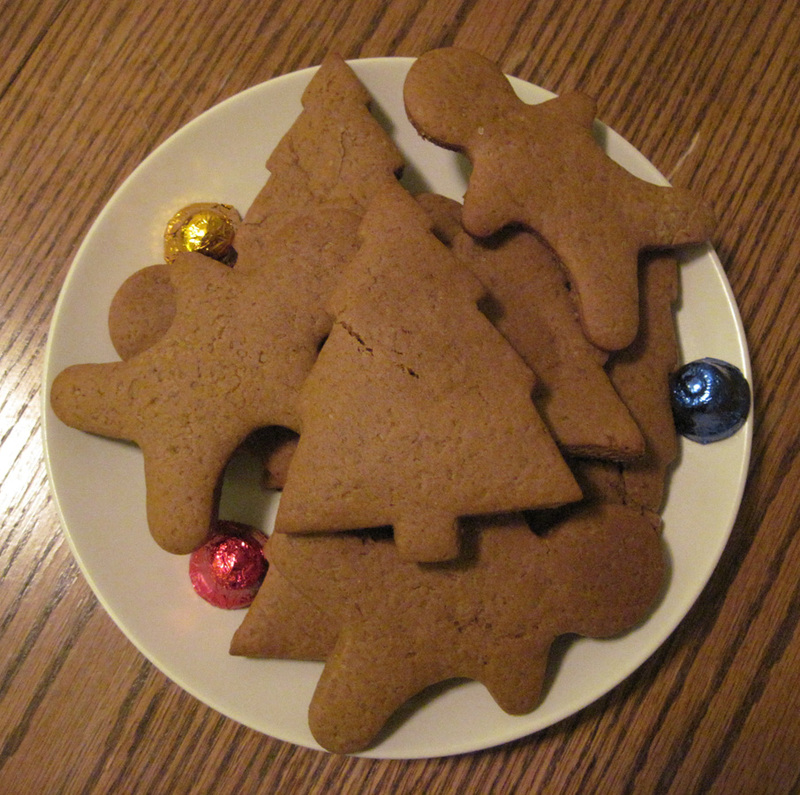 We made a batch of spritz, a family holiday tradition (though, alas, I lack a cookie press so they don’t look like spritz), and a batch of gingerbread trees and men. I did this while listening to a Pandora Christmas radio station blaring out “Carol of the Bells,” “Santa Baby,” and “Have Yourself A Merry Little Christmas” (and the occasional “Ima CHAINSAW that b*tch!” from the husband, who was indulging his “Gears of War” video game addiction in between helping making cookies and dinner). We’ve got enough cookies at this point I will probably have to start pressing them on total strangers in the street (or just our neighbors… no better way to meet neighbors than to give them cookies!). And since we’re lacking a Christmas tree… we have a Christmas chair! 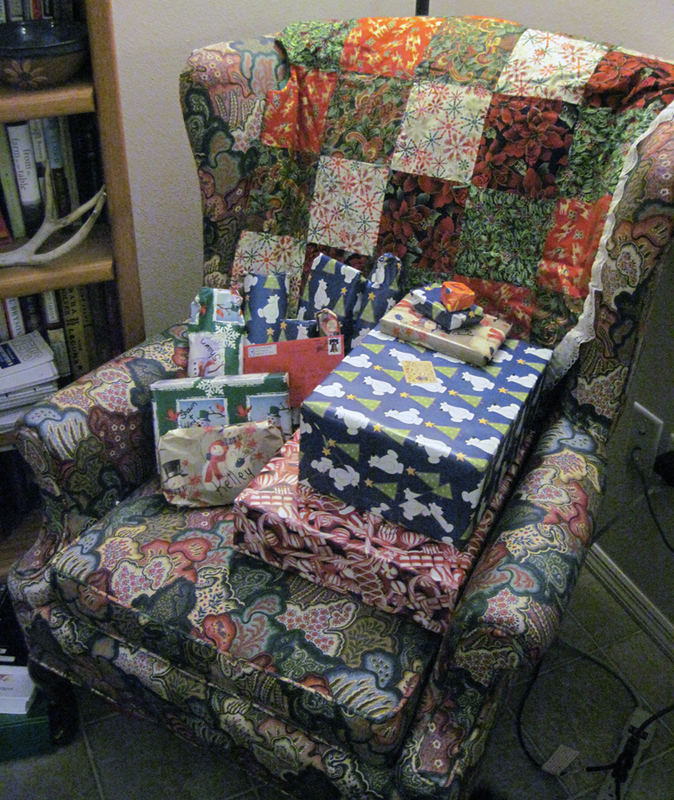 For your viewing pleasure, I draped the back of the chair with the lovely tree skirt my “Montana mom” Lynnette made for us for a wedding present, and piled the chair with presents from family. 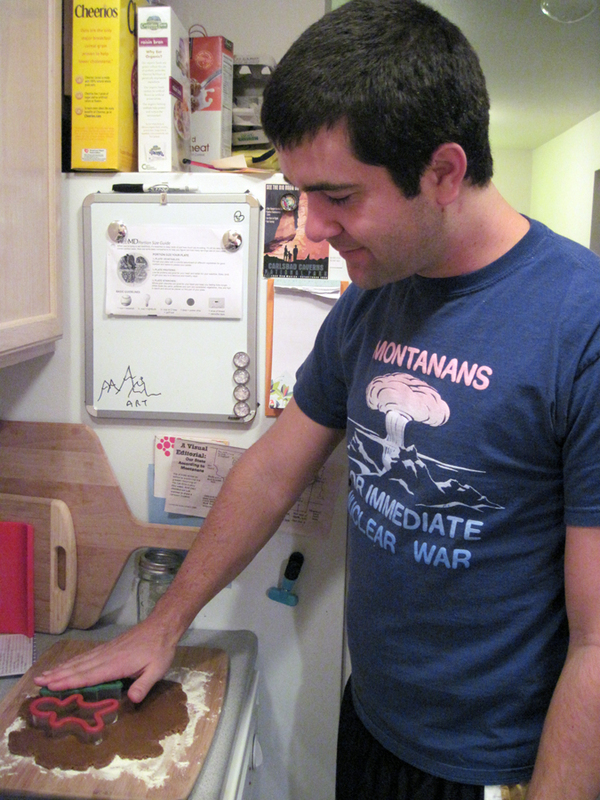 To top today off, Shawn (and the bread machine) made a loaf of homemade bread. 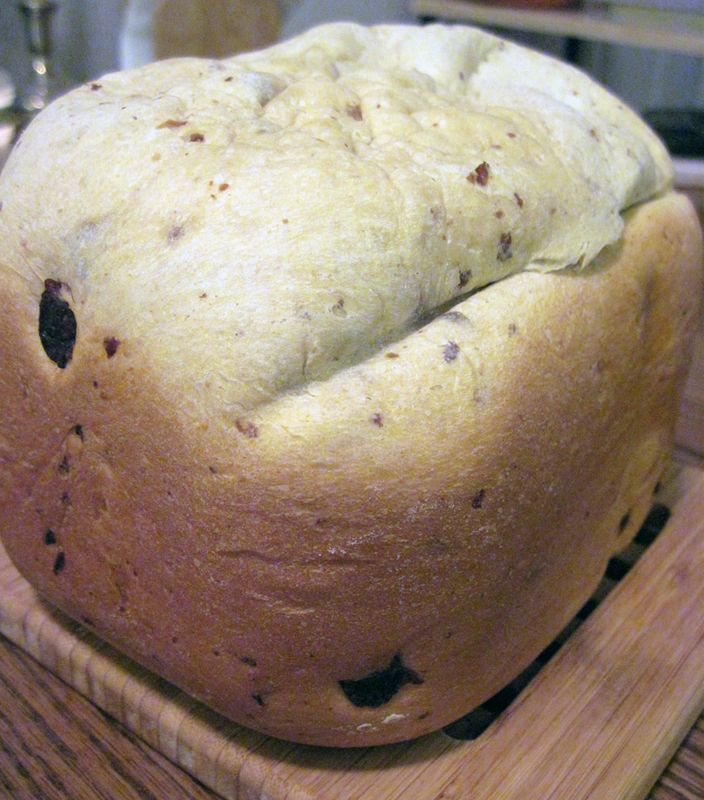 It’s one of our favorite recipes, with raisins and orange zest in it. Yum yum yum. We’re going to eat some tonight with homemade chicken pot pie. Things are definitely looking far more merry and bright. This is one of those projects I’ve been working on for a while. It got put on the back burner for the past month with school (alas, my autumn-themed project has spilled over into winter). But that it’s winter break, I can resume working on it! I’m planning to make it into a pillow. I post pictures of it when I finish. Speaking of projects, I finished the little birds for the mobile for Baby C’s room, so now all we have to do is glue them to the sticks and hang the mobile. I’ll also post a picture of that soon. 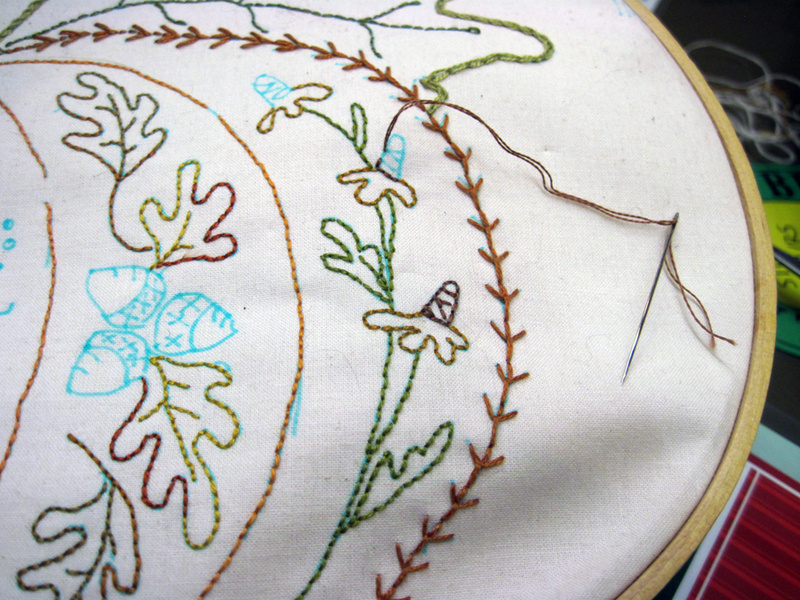 I’ve got scads of other projects planned for winter break, though. I want to make a stuffed puppy for the little boy, do some monogramming, make some Christmas presents, etc. Shawn and I moved my sewing desk into our room (wouldn’t fit in kiddo’s room), so I have a nice little workspace I’m putting together. I’m planning to string up an idea line, so once I get that put together I can post some photos. It’s nice to have a little workspace, even if it’s just the island of a desk where my sewing machine resides. Other Christmas break plans include making a ton of food to freeze to we don’t have to cook for a few weeks after the baby is born, applying for scholarships, writing, and enjoying the last month of “just the two of us” with my husband. I’m also trying to make the apartment a little more festive for Christmas because we’re not getting a tree… just too much hassle this year (And where would we put it? Our apartment is tiny). I already made one Christmas ornament and have plans for others. Never underestimate the power of Christmas music, festive candles and well-placed decorations. 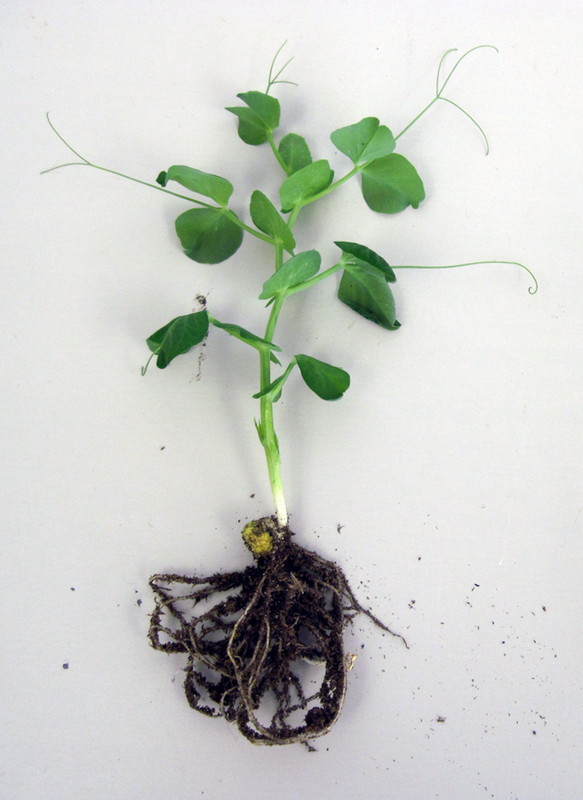 Grew this little dude (Little Marvel pea) in my biology lab. Loving the vibrant green when all around me is snow. What did you (or how did you) grow this year? There are some things in life I don’t get worked up about. Like fashion/the latest gadgets. Black Friday is wasted on folks like me. Or things like pro basketball/baseball/football. What can I say? I like college sports. There are however some things that I predictably get worked up about, such as politics, organic/local food, people who can’t figure out that driving in the snow is not difficult, and the newest one: diapers. Who knew a person could have a mini existential crisis over something as trivial as diapers? I’ve known for a while now (even before the unexpected pregnancy) that I wanted to use cloth diapers. I noticed the craze a few years ago and decided to see what the big deal was. Turns out most disposable diapers contain nasty chemicals like dioxins (carcinogenic), sodium polycarbonate (removed from tampons because it was linked to toxic shock syndrome… but it’s OK to put in diapers?! ), Volatile Organic Compounds (sound familiar? VOCs are the nasty, stinky chemicals in paint that we’re all trying to avoid! ), as well as dyes, fragrances and petroleum. And these chemicals cause issues as mild as diaper rash and as serious as reduced fertility and cancer. Definitely NOT what I want touching a baby’s sensitive skin! Armed with this knowledge, a few months ago I set out on my cloth diaper search (which are also known for causing less diaper rash and for helping kids potty train faster because cloth diapers don’t wick moisture away so the child knows he or she is wet). Here were my criteria: 100% cotton soaker pads (preferably organic), manufactured by a small and environmentally conscious company, with good reviews from users, and made in the USA. Well, three outta four ain’t bad. I looked at a number of cloth diaper brands, such as Gro-Via, BumGenius, Apple Cheeks, and FuzziBunz, among others (I can’t even remember them all, but it’s probably about a dozen). Turns out some of the companies don’t use cotton at all, but rather polyester even in the soaker pads. Not so soothing on baby’s bum. Others didn’t seem to be designed very well. And guess what? NONE were made in the USA. Sigh. In the end, I decided to go with Gro-Via (though I started out my search a BumGenius fan). Gro-Via diapers are made by a company located in Bozeman, near where I live. They’re made in China, but the company has a commitment to employing women at fair wages in modern, safe factories. And at least some of my money (and the money of friends and family helping me buy the diaper package) is staying in my community. The soakers are 100% organic cotton. But before this decision was made, I felt a lot of frustration about being unsuccessful in finding a well-made cloth diaper made in the USA. 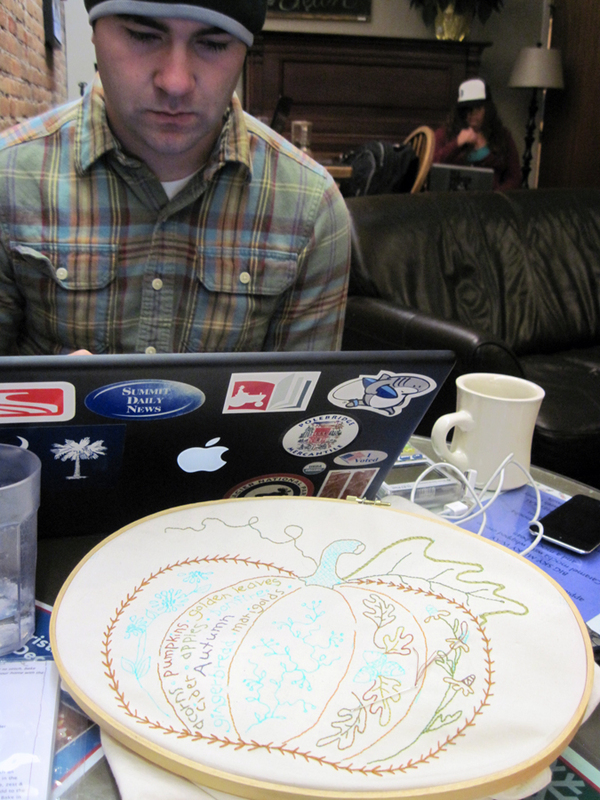 But then again I feel that same frustration frequently with all sorts of products. Here’s another way to get Americans employed again: Move manufacturing back to the U.S. This was definitely not something I thought I would agonize over like I did! But now the diapers have been purchased and they’re in the washing machine (I have to wash them 5 times or so before baby arrives so they become fully absorbent). And it’s a good thing too because we’re getting close to Baby C’s arrival! As of tomorrow, seven weeks! And something else I’ve noticed is that just about every single one of my friends with new babies have chosen to go the cloth diaper route, as well. My mom and mother-in-law have their doubts, but well, there have only been three generations in disposable diapers and many, many more generations in cloth. 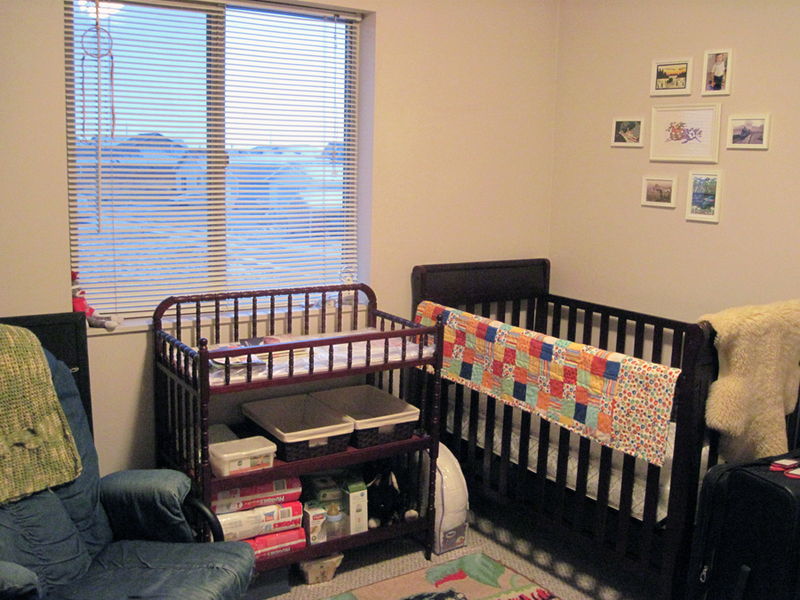 In other news, Shawn and I have gotten the nursery nearly finished. It’s still cluttered, but such is the fate of small apartment dwellers who need the second bedroom to pull triple duty as storage space, guest bedroom and nursery. And even though I still have pangs of sadness over the fact that Baby C doesn’t get a beautifully painted room with top-of-the-line furniture in a home my husband and I own, now that we’ve gotten the changing table and crib assembled and pictures on the wall, I like the way things are coming together. I had a baby shower the day after Thanksgiving and it was a lot of fun. I loved seeing many friends and family members, especially since we aren’t going home for Christmas and Shawn and I live so far away in the first place. And everyone was very generous. I received numerous adorable kiddo outfits (highlights were the “My dad is turtley awesome” outfit with a turtle on it and the Nebraska-themed “Throw the bones” onesie with crossed bottles on it), soft and fuzzy blankets, beautiful books, money to put toward the organic crib mattress, a Boppy pillow, baby monitor, and some gorgeous blankets made by my grandmother and mother-in-law. Truly, we are blessed. Update: Here’s a photo of the picture collage above the crib. I’ve had lots of requests to see them! 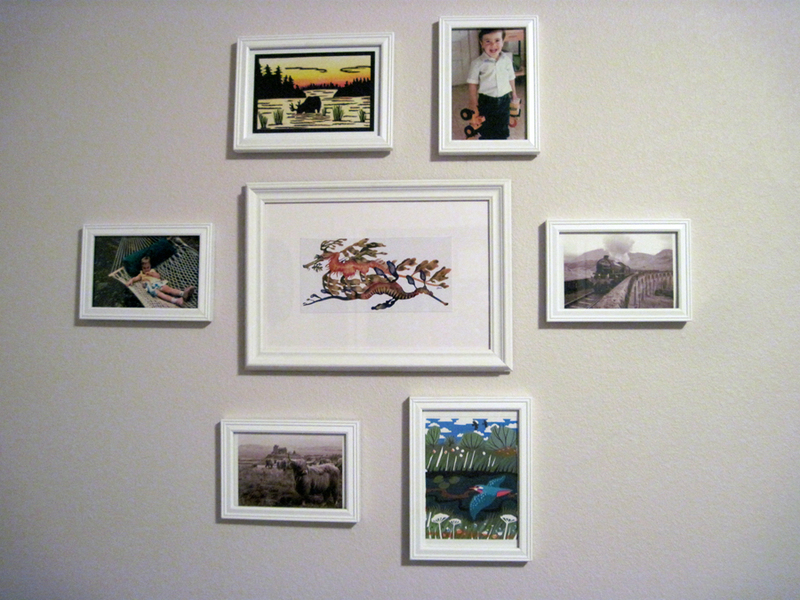 Clockwise, beginning in the top left corner, the pictures are: A woodcut of a moose in a pond by a local artist, a photo of Shawn as a little boy, a photo of a train in Loch Shiel, Scotland (more recently known for its role in the Harry Potter movies), a print of a kingfisher I picked up in London, a Scottish highland cow, and a photo of me as a little girl. In the middle is a picture of a leafy sea dragon and a weedy sea dragon (in the seahorse family) we picked up at the Monterey Bay Aquarium this past summer.